Also Known as Rowan Pohi by Ralph Fletcher. Review: A once in a lifetime opportunity, an application to Whitestone Prep, and the hands of Bobby Steele. You'd never guess how it ends up. The author of, Also Known As Rowan Pohi, is Ralph Fletcher. Fletcher takes you on a wild and crazy adventure as we follow "Rowan Pohi." Soon-to-be 16 year old Bobby Steele and his friends, (Marcus and Big Poobs) are sitting at their local hangout, IHOP, when they come across an application to Whitestone Prep. Whitestone is a very fancy private school where only rich kids go. But when the boys decide to mess around and send a fake application in, under the fake name Rowan Pohi, they end up in a sticky situation. The application is actually accepted! And Bobby decides to become Rowan Pohi! But Bobby decides not to tell any one that he is going to Whitestone. Now, Bobby doesn't have the best background either, so when he gets a chance he takes it. Bobby's father went to jail for hurting his wife a year ago. Now he is back, but his wife left. At first Bobby's plan is working well, he even develops a relationship with a few people. But, soon a school bully and his friends figure out his secret! With upset friends and a threatening school bully, what will Bobby do? Will he run away and hide? Or, will he stand up for himself? Also Known As Rowan Pohi is a great book. It includes drama, comedy, and even a little romance. I love the character that Fletcher made. Bobby sounds like a regular boy just trying to get by. I also very much enjoyed the comedic feel that Fletcher gave it. It helps make the story more interesting. At the same time I would not let an under-aged child read this book because it does have some foul language. Other than that it's the perfect story. The graphics supplied in Also Known As Rowan Pohi allow you to imagine yourself there next to Bobby, experiencing what he experiences. As much as this book is funny, it is emotional as well. Fletcher's amazing detail makes you feel how Bobby feels. And when he's in trouble, you feel sympathy for him. I cherish that in books. One of my favorite things about fictional books is that you get to "live" out your fantasies through the characters. And that is exactly what happened in Also Known As Rowan Pohi. That is my favorite quality in a book. 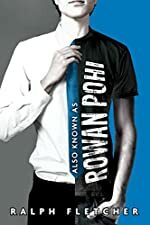 So, if you've got some extra time, pick up Also Known As Rowan Pohi, I think you'll enjoy it. Review written by Savannah (7th grade student). We would like to thank Houghton Mifflin Harcourt for providing a copy of Also Known as Rowan Pohi for this review. Have you read Also Known as Rowan Pohi? How would you rate it?